A teeth cleaning and checkup recall should be incorporated into everyone’s routine. The American Dental Association strongly recommends at minimum a professional dental cleaning every six months. Professional teeth cleanings offer many benefits that even those with excellent oral hygiene can gain value from. These cleanings improve oral health and help professionals identify any potential problems before they begin to hurt. At Highlands Ranch Family Dental we strive to offer our patients the best possible dental cleaning experience. What Happens During a Dental Cleaning Visit? First, any pertinent medical information that may impact oral health is reviewed with the patient, including medications, diabetes, pregnancy, or heart problems. A digital X-ray series may be taken of the patient’s mouth. This is to help us identify any potential cavities, loose or degrading fillings, or any other problems that may not be visible to the eye. If the patient mentions any concerns with chewing, biting, or grinding, Dr. Lunn may be consulted and solutions such as a mouth guard, orthodontics, or TMJ treatment may be discussed. The hygienist will thoroughly clean the surface of each tooth. 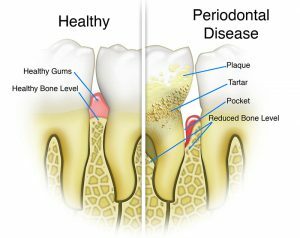 Plaque and tartar can build up on the surface of teeth, and may not be fully removed with regular brushing or flossing. Using a state of the art gentle scaler, we can safely remove this build up. This step is important, as there are many areas between teeth that may not be fully cleaned with regular oral hygiene maintenance. The hygienist may find the need to apply special numbing gels to the gums for a more comfortable cleaning. Finally, the teeth will be polished, which may also help remove surface stains on the teeth. Most of us are aware that poor dental hygiene can lead to tooth decay, gum disease, and bad breath – but not brushing your teeth could also have consequences for more serious illnesses. Research has shown that patients with poor dental hygiene are susceptible to Alzheimer’s, pancreatic cancer, and heart disease. Having your teeth cleaned every 6 months is vital to your overall health.